3 Ingredient Grilled Chicken Parmesan is super easy to make and is a recipe that your whole family will love! For my husband's birthday, he requested chicken parmesan. As a dietitian, I am always trying to make meals healthier. It was actually my mom's idea to grill the chicken parmesan instead of breading it and frying it. This made the chicken parmesan healthier, lower in fat and calories. The grilled flavor really added to this meal. It turned out excellent and my entire family enjoyed it. My dad's favorite meal is chicken parmesan and he was amazed how quick the recipe came together and how little he missed the breading. 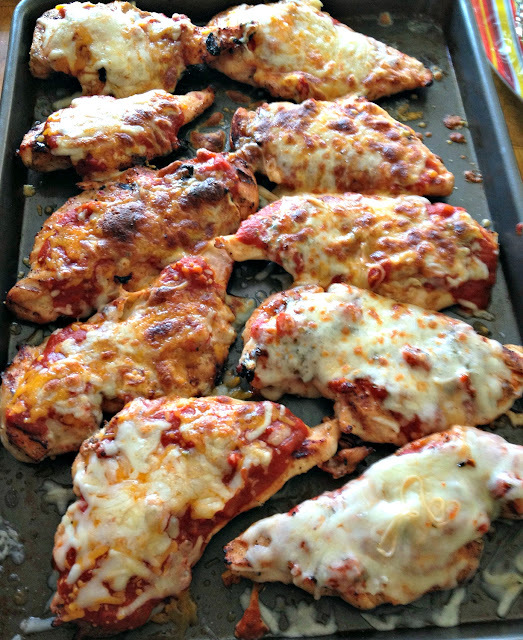 3 Ingredient Grilled Chicken Parmesan- easy and delicious! Much healthier than the breaded and fried version. 2/3 cup shredded parmesan cheese. 1. Place chicken directly on a hot grill and cook chicken until cooked throughout and chicken is browned. 2. Take chicken off the grill and place on a nonstick baking sheet. 3. Top with about 1 tablespoon pasta sauce and parmesan cheese. 4. Turn the broiler on high and broil chicken for about 4 minutes or until cheese is melted. We served this chicken with a side of pasta and grilled summer squash and zucchini. The meal was enjoyed by all! I plan to make this recipe very soon again this summer. It was delicious. This looks delicious, Amanda. Thank you for posting! This looks heavenly, Amanda. Much obliged to you for posting!